Saul Good Gift Baskets is proud to offer gift basket delivery in Vancouver, in Toronto, and throughout Canada. Our signature gift boxes ship extremely well and our free shipping and flat rate options keep it affordable. Shipping time varies depending on the address. Our standard service for Vancouver gift basket delivery and Toronto gift basket delivery is next business day. Shipping can take from 2-8 days for other Canadian destinations. Gift baskets priced at $99 and above qualify for free shipping within Canada. If you're purchasing multiple gifts shipping to the same Canadian address and the total is $99 or higher you also qualify for free shipping. Flat rate shipping options are available for gift baskets that do not qualify for free shipping. Reasonable conditions apply, like if your order is being shipped to a remote community or province for example (ex. Yukon, Northwest Territories, Nunavut). Valid for most Canadian shipping destinations. Shipping lead times vary from next business day to up to 8 days to Eastern Canada. For orders that require rush shipping, we do offer express shipping options. For most cities in Canada this is a guaranteed service for delivery by noon (local time), next business day. Toronto gift basket orders must be placed by 12pm (Eastern time) to be eligible. Vancouver gift basket orders must be placed by 12pm (Pacific time) to qualify. Our state of the art check out process allows you to ship gifts to various recipients. Just add new shipping addresses as appropriate for each gift and change the quantities to reflect how many of the gift you'd like to send to the recipient. 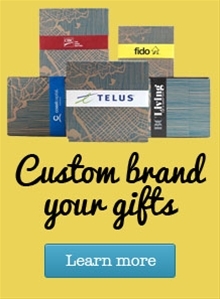 Each gift can be personalized with it's own to/from gift tag and greeting card message. If you have any questions or trouble with the check out process just give us a call at 1.800.848.6102. Over the years we've found that a considerable amount of our carbon footprint comes from shipping so we've come up with a few ways to keep our footprint small. Check out this fun video from a gift basket delivery we did in downtown Vancouver working with our friends at SHIFT Delivery. When we use courier services we work with Novex, a leading courier company in Vancouver that have shown leadership in the pursuit to eliminate carbon emissions from their fleet.